Yesterday, President of India, Pranab Mukherjee addressed the Parliament and took them through the agenda and roadmap of what new Modi-led Government wants to achieve. The points presented were very similar to BJP’s manifesto. 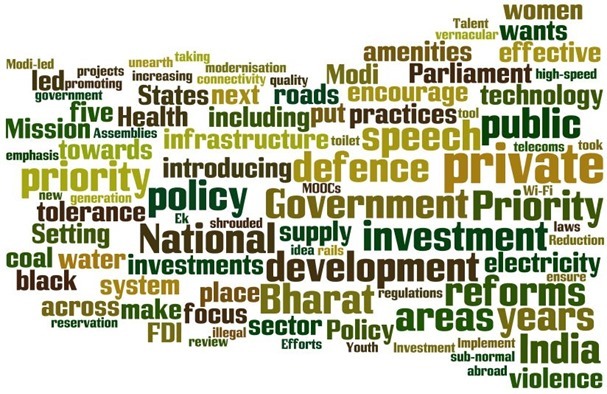 What is really good to see is that Modi led Government wants clearly focus on economic reforms by introducing simplified tax structure, encourage Foreign Direct Investment and break the policy paralysis that has shrouded India over past 5 years. Here are the highlights of the speech. Reducing food inflation will be the top-most priority. Improvement in supply chain of Agricultural products and taking effective steps to prevent hoarding & black marketing. Contingency plans to be put in place for sub-normal monsoons. Increase investment in agriculture, both public and private in Agri-infrastructure. Introducing scientific practices & technology in Agriculture to make it profitable. Will give 33 percent reservation to women in the Parliament and State Legislative Assemblies. Special emphasis will be given on improving the intra-region connectivity and border infrastructure in the Northeast as well as in J&K. Stress will be given on putting in place transparent systems and time-bound delivery of government services to citizens. Efforts will be made to eliminate obsolete laws, regulations, administrative structures and practices. Wi-Fi zones will be put up in critical public areas in the next five years. Social Media will be used as a tool for participative governance, directly engaging the people in policy making and administration. Reforms will be undertaken to enhance the ease of doing business. Job creation by promoting tourism and agro-based industries. Will set up a task force to review and revive our MSME sector. Will build 100 Cities focused on specialized domains and equipped with world class amenities. Every family will have a pucca house with water connection, toilet facilities, 24×7 electricity supply and access. Bring renewed vigour in its engagement with the United States in all areas including trade, investment, science and technology, energy and education. You can find the entire text of President’s speech here. Good education and medical facility is very important than anything. Nowadays these two are the main commercial activities in India. Due to this, poor and middle class people are not getting proper education and medical facilities.